Michael Myers returns in David Gordon Green's Halloween, picking up 40 years after John Carpenter's 1978 classic. Prepare for the highly-anticipated release with Fright-Rags' official Halloween 2018 merchandise. Michael Myers stalks onto seven T-shirts, which feature new designs as well as official artwork. Select designs are available on zip-up hoodies, baseball tees, and women's shirts. There are also four enamel pins, including a closet door that opens to reveal The Shape behind it. The Halloween 2018 collection is on sale now at Fright-Rags.com. October 9 is the last day to place an order and receive it in time for the film's release on October 19; applies to US orders only. These designs and more will also be available from Fright-Rags at the Halloween: 40 Years of Terror convention in Pasadena, CA on October 12-14. 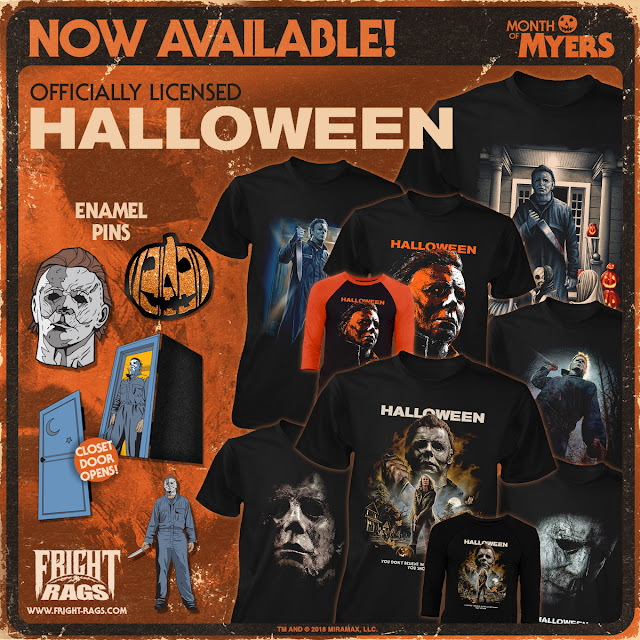 The Halloween line kicks off Fright-Rags' Month of Myers, which will include apparel from Halloween 1978 (dropping October 8), Halloween II and Halloween III (dropping October 17), and Halloween IV, Halloween V, and Halloween VI (dropping October 24).